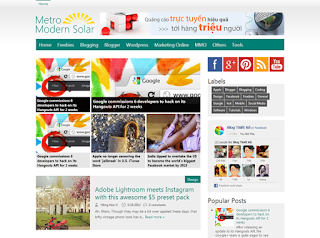 Metro Modern Solar V1 Blogger Template is the newest Blogger Templates from Hong Hoa Vi. This template uses gray tones turquoise elegance and sophistication. Suitable for personal pages and all the technology news magazine. HHV was inspired by Windows 8's Metro interface to make this template. But Metro Modern Solar also have its own unique. This template features Cool Labels, Big Social icons Links at footer etc. This template is suits all types of blogs but is best for tech and news blogs.